Marvel inks Spider-Man deal with Sony, but will Amy Pascal become Kevin Feige’s Mephisto? Spider-Man fans are rejoicing today because Sony finally admitted that it has no idea what it’s doing with the world’s most famous wall-crawler. A deal was struck between Sony Pictures and Marvel Studios that will allow Spider-Man to appear in Marvel’s cinematic universe, but it also forces Kevin Feige to produce Sony’s next installment with Amy Pascal. 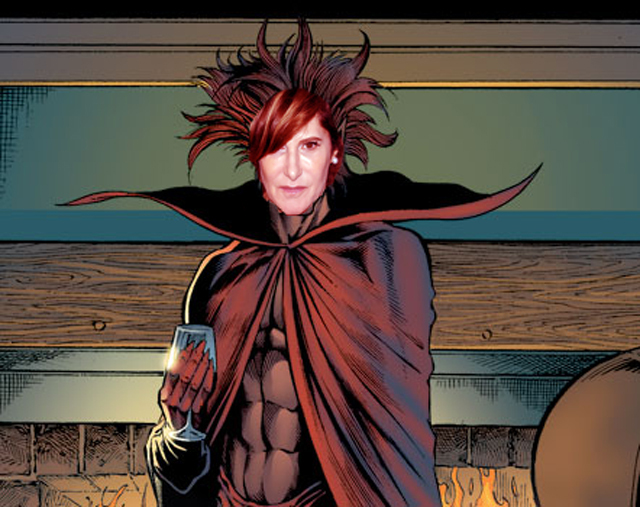 Question: Will Amy Pascal become Kevin Feige’s Mephisto? In the short run, this is great for Marvel. Kevin Feige has done a wonderful job bringing the Marvel universe to the big screen, and there is no reason to believe that he will screw it up with Spider-Man. However, in the long run Sony still has creative control over the character and now the company must deal with Amy Pascal. Sony’s S.S. Spider-Man was foundering and in many ways Marvel may have just come to the rescue of drunk captains who deserved to lose it all. It will be a sad day if Kevin Feige’s name is attached to future Spider-Man failures because of Amy Pascal’s intransigence. While Spider-Man fans should be thrilled that the character will show up in future Marvel Studios movies, they should seriously ask themselves if Marvel made a deal with the devil when total victory was within reach. It’s not just Pascal that’s sticking around, Avi Arad is too. OTOH, this can also be seen as the MCU camel getting its nose inside the Sony tent. A few more financial body-blows, and Sony will watch the Marvel camel trotting off with 100% of the tent’s Spider-Man contents. That would be the ideal outcome, Jack. I’d love it if Marvel took back total control of Spider-Man’s movie rights. I guess Sony still wants to do a “Sinister Six” movie. I can’t see them actually doing this right. Maybe now that Marvel is involved it will all pan out, but I just see it turning into a bloated mess. This deal is a patch-up Sony has applied to appease the fans and get them to move on. It seems like a good idea in context, but beside what you said, the film is set for release in 2017. There are a lot of cape films out that year – what happens if the bubble explodes? Sony will be done and dusted – and with Marvel attached, they’ll be dented as well. At this rate I’d rather have the prospective Mario film. There are a lot of cape films out that year – what happens if the bubble explodes? On this one I can’t agree with you, my friend. I don’t think there is a “bubble” to burst. I’ve heard about such a bubble since around 2004. People will see good superhero movies (e.g., The Avengers, 2012) and they’ll stay home when movies like Elektra (Fox, 2005) or The Punisher (Lions Gate, 2004) come out. To me, saying there is a “Super Hero bubble” is just as strange as if someone said there’s a “Bond bubble.” No there’s not. There are only mediocre and bad movies. When Marvel gets lazy, then they’ll start making duds just like Sony. When they stop trying to push the envelope, then people will get bored with them. As long as they’re constantly striving to break new ground and put out quality products, they’ll continue to pack theaters. I can’t help but think there’s some 20th Century Fox executive laughing at all of this: at Sony for having so much trouble with a flagship franchise and at Marvel for cutting a deal in which they don’t get creative control. Fox has had their hooks in the X-Men franchise since the Fox channel aired the ’92 cartoon and tried to turn “Generation X” into a live-action series. I don’t think they’ll ever give the franchise up or even try a deal like this. If they have a setback (The Last Stand, Wolverine Origins), they’ll just try harder rather than throw in the towel. They’d probably also keep Fantastic Four if that new movie bombs, though that might just be out of spite. I am a little shocked that Sony went this way instead of running Spider-Man totally into the ground like they were on track to do. I suppose the thinking is that seeing Spider-Man in a Marvel movie will generate interest in the character that was certainly waning due to their last three attempts at getting him right. Marvel will do him right, and then they’ll ride Marvel’s coattails. We’ll see how it goes. Maybe I’m wrong, but I just think a Venom movie will be bad. I guess that’s supposed to still be in the works. The character has always looked cool, but other than that I always found him to be rather forgettable. “Sinister Six” sounds promising in theory, but in the wrong hands it will implode. Spider-Man 3 (2007) and Amazing Spider-Man 2 (2014) should have taught them not to juggle too many villains. How bad does Sony need to screw up before the lesson finally sinks in? If that happens, the FF may never appear in a Marvel comic again. Whilst it is good Marvel is now more involved with the Spider-man films, the outcome might not be so good. In the Sony email leaks there were discussions between Marvel and Sony. Marvel wanted to reboot Spider-man with a new younger actor and focus on a highschool Spider-man stories. There’s speculation in various articles I’ve read about the new deal that Andrew Garfield is out and they’re already looking for a new younger actor. Also they’ve apparently reshuffled the MCU film scheduled to fit in the rebooted Spider-man film (I believe the Thor film lost its slot). The good posters at Crawlspace posted some hilarious (but also worrying) speculation that the rebooted MCU Spider-man will be based off the Disney Ultimate Spider-man cartoon (lol). Personally I think another reboot would be a bad idea. A better strategy would be to do what MGM did with Skyfall. Quantum of Solace was an unsuccessful Bond film at the box office and rather than Skyfall continuing the Quantum of Solace trilogy idea, they made Skyfall a really good standalone film which actually saved the franchise. My recommendation for Marvel would be to emulate what MGM did with Skyfall and make Amazing Spider-man 3 a really good standalone film that ties Spidey to the MCU. In Amazing Spider-man 2, Peter finished high school which allows Marvel could start on a clean slate and focus on telling “Peter in college” stories which IMO were some of his best stories in the comics. Peter also hasn’t met Mary Jane yet in the Amazing Spider-man films so that is another goldmine for Marvel. Riablo, you’ve got a really good feel for entertainment. I think Sony should hire you! Those last two paragraphs that break it down by referencing Skyfall and Quantum of Solace was impressive. I’m not just saying that — you’re spot on with you’re analysis. Kudos.